The practice requires that one intentionally directs focus away from states of mind that would otherwise occupy them, such as frightening or worrisome thoughts, and instead observe and accept the present situation and all it has to offer, regardless of whether that is good or bad. Mindfulness approaches include mindfulness based cognitive therapy, (MBCT), mindfulness based stress reductions (MBSR), acceptance and commitment therapy (ACT) and dialectical behaviour therapy (DBT). These approaches are becoming widely accepted methods for relieving symptoms related to many psychological issues and can be applied across many different population segments. Mindfulness is practiced individually or in group settings. 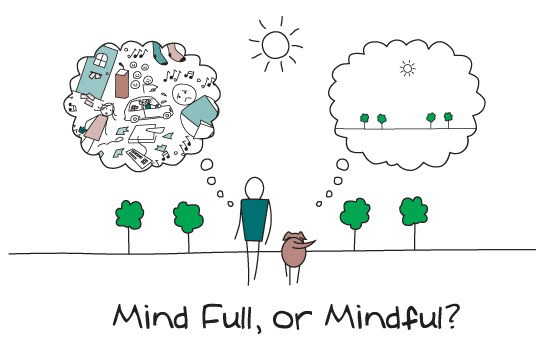 Mindfulness based approaches can be used to address a multitude of symptoms and circumstances. Clients progress to mindfulness over time, and it requires dedication and practice. Once the skill of mindfulness has been learned, a client is able to integrate this therapeutic technique into virtually any situation that presents itself in order to maintain a sense of control in what might otherwise be an overwhelming experience. Psychological insight and emotional healing occur over time through the regular practice of mindfulness. Mindfulness based approaches and contemplative approaches are aimed at relieving the symptoms of psychological stress, negative mental states and physical pain. One technique of mindfulness involves using gentle yoga movements and meditation to heighten a client’s awareness of physical sensations. The client is guided through verbal cues to maintain attention on movement, breathing and feelings throughout several different exercises. Walking and sitting meditations are common tools for the mindfulness based approach. Eventually, the client is encouraged to practice mindfulness in daily life. This continues the therapeutic process outside of the confines of the client-therapist session and allows the client the opportunity to observe, explore and experience mindfulness in a non-clinical environment. The clinician and client evaluate and examine the effects and obstacles encountered during daily life, and use this as a catalyst for behaviour and thought modification.